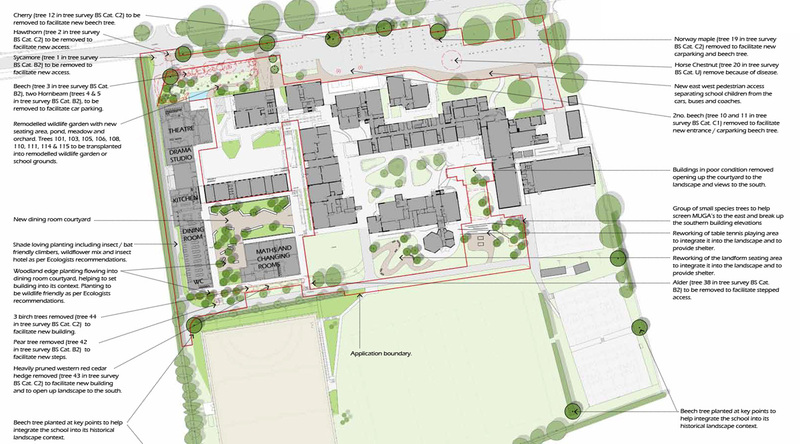 We were brought into the design team by Feilden Fowles to help address Bath & North East Somerset Council’s concerns about the visual impact of this school development upon its surroundings, and to help develop an overall landscape masterplan for the school. We developed a landscape strategy that would improve the north side of the school along Claverton Road, whilst at the same time rationalising the car parking and bus drop-off strategy. 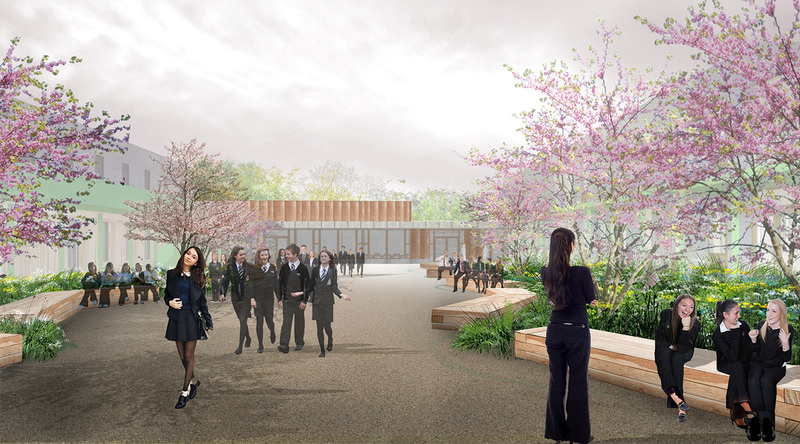 We then looked at the landscape associated with the proposed new buildings, designing a new dining hall courtyard to the western side of the school and re-designing new spaces created by the removal of redundant buildings. 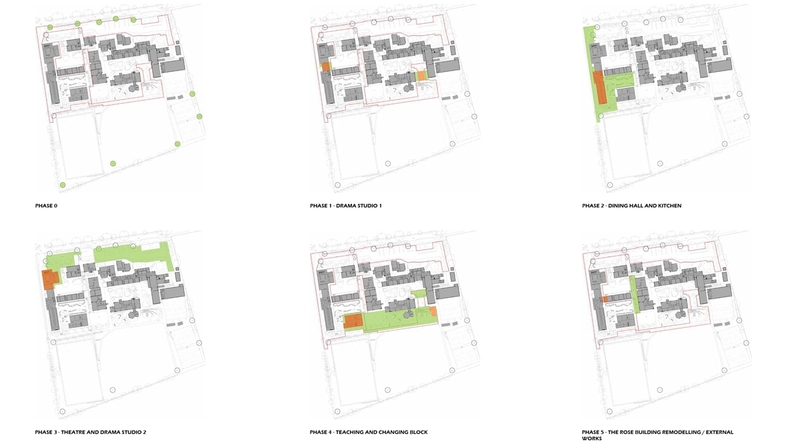 The new dining hall courtyard will provide a generous central route to the proposed dining room. Wide top picnic seats are positioned to encourage groups of pupils to eat their lunch amid the naturalistic planting, under small blossom trees. 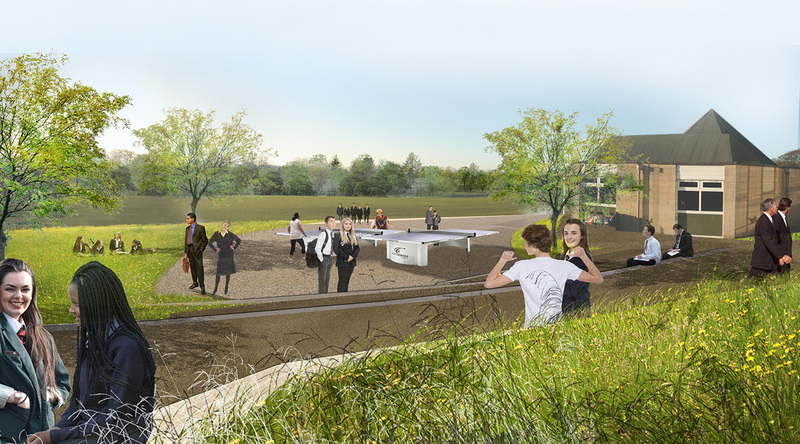 The newly opened-up spaces to the south east will be designed so that new soft landscape islands can flow into the existing central courtyard, creating strong connections with the landscape to the south. Seating terraces will be introduced to address level changes and to help define a new table tennis area. Medium size feature trees will add shelter and help to break up the south façade of the school buildings. There are existing, newly planted areas of the school that are really successful. We will build on the success of these spaces to further unify the landscape by continuing to use wildlife friendly planting throughout, with insect hotels and other pro-active measures designed to encourage wildlife into the grounds. Once the western development is complete, work on the southern and eastern landscapes will begin.